The First Intermediate Period, often described as a "dark period" in ancient Egyptian history, spanned approximately one hundred years after the end of the Old Kingdom from ca. 2181-2055 BC. It included the seventh, eighth, ninth, tenth, and part of the eleventh dynasties. Very little monumental evidence survives from this period, especially towards the beginning of the era. During this time rule of Egypt was roughly divided between two competing power bases. One of those bases resided at Heracleopolis in Lower Egypt, a city just south of the Faiyum region. The other resided at Thebes in Upper Egypt. It is believed that during this time, the temples were pillaged and violated, their existing artwork was vandalized, and the statues of kings were broken or destroyed as a result of this alleged political chaos. These two kingdoms would eventually come into conflict, with the Theban kings conquering the north, resulting in reunification of Egypt under a single ruler during the second part of the eleventh dynasty. The fall of the Old Kingdom is often described as a period of chaos and disorder by some literature in the First Intermediate Period, but mostly by literature written in successive eras of ancient Egyptian history. The causes that brought about the downfall of the Old Kingdom are numerous, but some are merely hypothetical. One reason that is often quoted is the extremely long reign of Pepi II, the last major pharaoh of the 6th Dynasty. He ruled until he was very elderly (100 years), outliving many of his heirs and therefore, created problems with succession in the royal household. Thus, the regime of the Old Kingdom disintegrated amidst this disorganization. Another major problem was the rise in power of the provincial nomarchs. Towards the end of the Old Kingdom the positions of the nomarchs had become hereditary, so families often held onto the position of power in their respective provinces. As these nomarchs grew increasingly powerful and influential, they became more independent from the king. They erected tombs in their own domains and often raised armies. The rise of these numerous nomarchs inevitably created conflicts between neighboring provinces, often resulting in intense rivalries and warfare between them. A third reason for the dissolution of centralized kingship that is mentioned was the low levels of the Nile inundation which may have resulted in a drier climate and lower crop yields bringing about famine across ancient Egypt. The seventh and eighth dynasties are often overlooked because very little is known about the rulers of these two periods. Manetho, a historian and priest from the Ptolemaic era, describes 70 kings who ruled for 70 days. This is most likely an exaggeration to describe the disorganization of the kingship during this time period. The seventh dynasty was most likely an oligarchy based in Memphis that attempted to retain control of the country. The eighth dynasty rulers, claiming to be the descendants of the sixth dynasty kings, also ruled from Memphis. Little is known about these two dynasties since very little textual or architectural evidence survives to describe the period. However, a few artifacts have been found, including scarabs that have been attributed to king Neferkara I of the seventh dynasty as well as a green jasper cylinder of Syrian influence which has been credited to the eighth dynasty. Also, a small pyramid believed to have been constructed by King Ibi of the eighth dynasty has been identified at Saqqara. After the obscure reign of the seventh and eighth dynasties kings, a group of rulers rose out of Heracleopolis in Lower Egypt, reigning for approximately 594 years. These kings comprise the ninth and tenth dynasties, each with nineteen listed rulers. They were believed to have descended from Libyan invaders who came into Egypt from the west through the Fayum region. This is often viewed as a foreshadowing of the Hyksos invasion of the Delta which would occur during the Second Intermediate Period. The Heracleopolitan kings eventually overwhelmed the weak Memphite rulers to create the ninth dynasty. The founder of the ninth dynasty, Kheti I, is often described as an evil and violent ruler, most notably in ManethoÕs writing. Also known as Akhthoes or Akhtoy, Kheti I was described as a king who caused much harm to the inhabitants of Egypt, was seized with madness, and was eventually killed by a crocodile. This may have simply been a myth, but he is listed as a king in the Turin Canon. 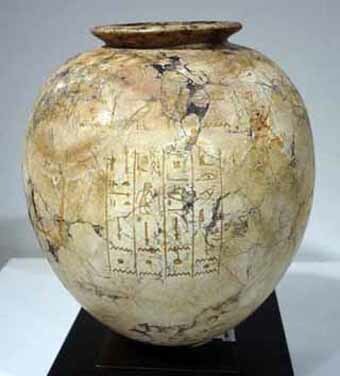 Kheti I was succeeded by Kheti II, also known as Meryibre. His reign was essentially peaceful, but experienced problems in the Delta. It was his successor, Kheti III, who would bring some degree of order to the Delta, although the power and influence of these ninth dynasty kings were still relatively insignificant compared to that of the Old Kingdom pharaohs. A distinguished line of nomarchs rose out of Siut (or Asyut), which was a powerful and wealthy province in the south of the Heracleopolitan kingdom. These warrior princes maintained a close relationship with the kings of the Heracleopolitan royal household, as evidenced by the inscriptions in their tombs. These inscriptions provide a glimpse at the political situation that was present during their reigns. They describe the Siut nomarchs digging canals, reducing taxation, reaping rich harvests, raising cattle herds, and maintaining an army and fleet. The Siut province acted as a buffer state between the northern and southern rulers and the Siut princes would bear the brunt of the attacks from the Theban kings. It has been suggested that an invasion of Upper Egypt occurred contemporaneous with the founding of the Heracleopolitan kingdom, which would establish the Theban line of kings, constituting the eleventh and twelfth dynasties. This line of kings is believed to have been descendants of Intef or Inyotef, who was the nomarch of Thebes, often called the "keeper of the Door of the South". He is credited for organizing Upper Egypt into an independent ruling body in the south, although he himself did not appear to have tried to claim the title of king. However, his successors in the eleventh and twelfth dynasty would later do so for him. One of them, Intef II, begins the assault on the north, particularly at Abydos. Intef III completes this attack on the north and eventually captures Abydos, moving into Middle Egypt against the Heracleopolitan kings. The first three kings of the eleventh dynasty (all named Intef) were, therefore, also the last three kings of the First Intermediate Period and would be succeeded by a line of kings who were all called Mentuhotep. Mentuhotep II, also known as Nebhepetra, would eventually defeat the Heracleopolitan kings around 2033 BC and unify the country to continue the eleventh dynasty, bringing Egypt into the Middle Kingdom. The emergence of what is considered literature by modern standards seems to have occurred during the First Intermediate Period, with a flowering of new literary genres in the Middle Kingdom. A particularly important piece is the Ipuwer Papyrus, often called the Lamentations of Ipuwer or the Admonitions of Ipuwer, which is attributed to the tenth or eleventh dynasty. The text is written in first person, with Ipuwer speaking in the presence of a king, or possibly the god Atum, as he tries to waken in the king or deity a sense of responsibility for the dismal condition of the state. Ipuwer complains about the break-down of law and the disorderly fashion in which the government is currently being run. He also talks about noble ladies having to beg for food while former servant girls are being clothed in gold and lapis lazuli. He speaks of foreigners who are coming into the country and becoming Egyptians. Ipuwer is especially upset with the fact that ships are no longer sailing to Byblos and that trade with other nations was ebbing. A line in the text reads, "It is grief that walketh through the land, mingled with lamentations". The text, whether it is a fictional or historically accurate text, paints a very dismal and disordered picture of Egypt during the First Intermediate Period. As stated above, the First Intermediate Period in Egypt was generally divided into two main geographical and political regions, one centered at Memphis and the other at Thebes. The Memphite kings, although weak in power, held on to the Memphite artistic traditions that had been in place throughout the Old Kingdom. This was a symbolic way for the weakened Memphite state to hold on to the vestiges of glory in which the Old Kingdom had reveled. On the other hand, the Theban kings, physically isolated from Memphis, had no access to these Memphite artworks and thus, were able to craft new artistic styles that reflected the creativity of the artists who were no longer controlled by the state. The building projects of the Heracleopolitan kings in the North was very limited. Only one pyramid believed to belong to King Merikare (2065-2045 BC) has been identified at Saqqara. Also, private tombs that were built during the time pale in comparison to the Old Kingdom monuments, in quality and size. There are still relief scenes of servants making provisions for the deceased as well as the traditional offering scenes which mirror those of the Old Kingdom Memphite tombs. However, they are of a lower quality and are much simpler than their Old Kingdom parallels. Wooden rectangular coffins were still being used, but their decorations became more elaborate during the rule of the Heracleopolitan kings. New Coffin Texts were painted on the interiors, providing spells and maps for the deceased to use in the afterlife. The rise of the Theban kings around 2123 BC brought about an original more provincial style of art. This new style is often described as clumsy and unrefined and may have been due to the lack of skilled artisans. However, the artworks that survived show that the artisans took on new interpretations of traditional scenes. They employed the use of bright colors in their paintings and changed and distorted the proportions of the human figure. This distinctive style was especially evident in the rectangular slab stelae found in the tombs at Naga el-Deir. In terms of royal architecture, the Theban kings of the early eleventh dynasty constructed rock cut tombs called saff tombs at El-Tarif on the west bank of the Nile. This new style of mortuary architecture consisted of a large courtyard with a rock-cut colonnade at the far wall. Rooms were carved into the walls facing the central courtyard where the deceased were buried, allowing for multiple people to be buried in one tomb. The undecorated burial chambers may have been due to the lack of skilled artists in the Theban kingdom. The end of the First Intermediate Period is placed at the time when Mentuhotep II of the eleventh dynasty defeats the Heracleopolitan kings of Lower Egypt and reunites Egypt under a single ruler. This act helps usher in a period of great wealth and prosperity, known as the Middle Kingdom.